What Day Of The Week Was January 17? 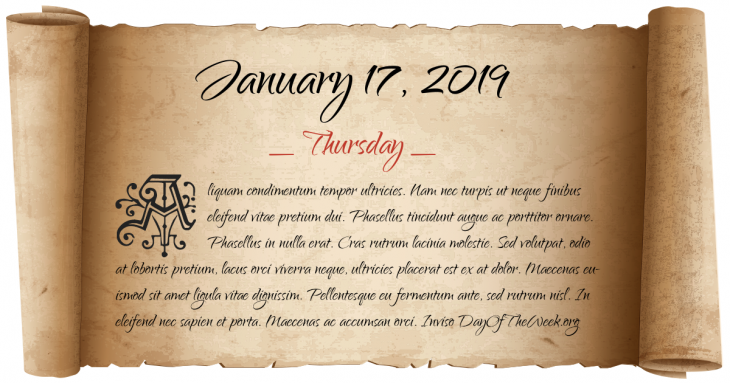 January 17, 2019 was the 17th day of the year 2019 in the Gregorian calendar. There were 348 days remaining until the end of the year. The day of the week was Thursday. Emperor Theodosius I dies at Milan, the Roman Empire is re-divided into an eastern and a western half. The Eastern Roman Empire is centered in Constantinople under Arcadius, son of Theodosius, and the Western Roman Empire in Mediolanum under Honorius, his brother, at the age of 10. France recognizes the Huguenots under the Edict of Saint-Germain. Emperor Susenyos of Ethiopia surprises an Oromo army at Ebenat; his army reportedly kills 12,000 Oromo at the cost of 400 men. The United States pays Denmark $25 million for the Virgin Islands. Popeye the Sailor Man, a cartoon character created by Elzie Segar, first appears in the Thimble Theatre comic strip. Franco-Thai War: French forces inflict a decisive victory over the Royal Thai Navy. Gulf War: Operation Desert Storm begins early in the morning. Iraq fires 8 Scud missiles into Israel in an unsuccessful bid to provoke Israeli retaliation. During a visit to South Korea, Japanese Prime Minister Kiichi Miyazawa apologizes for forcing Korean women into sexual slavery during World War II. Who were born on January 17?